A false Yelp review can be devastating to a business. There are a number of factors that vary the impact of a false review, including of course the nature of the false review, and the number of honest, positive reviews to offset it. But a recent study determined that a single false Yelp review can cut a business’s gross income by 20%. I personally have seen situations involving businesses with few reviews are put out of business by false reviews. Unfortunately, Yelp thrives on negative reviews. A big part of Yelp’s income comes from businesses that pay to subscribe to Yelp’s business services. Most of the incentive for wanting to pay Yelp comes from a desire to set forward a better image on Yelp, and for that Yelp needs negative reviews. A business with nothing but positive Yelp reviews is less incentivized to pay Yelp. 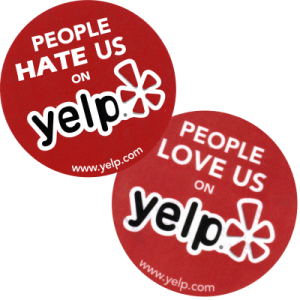 It is NOT true that paying Yelp will allow removal of negative reviews, or that failing to pay Yelp results in removal of all positive reviews, at least not directly. I don’t believe that there is a secret manual within Yelp, instructing its salespeople to retaliate against businesses that refuse to sign up for Yelp’s services, but I have received too many calls from potential clients, complaining that is just what happened, to believe that it is mere coincidence. The story is always the same. The business was going along, singing a song, with nothing but positive Yelp reviews. Then, out of the blue, two or more negative reviews appear, usually blatantly fake in nature, because the “reviewers” complain about some product or service the business does not even offer. In one instance, the caller to our office received two fake reviews in two days, both using names of famous athletes. Yelp undoubtedly has a mechanism that notifies its salespeople when a business has received negative reviews, because shortly after these fake reviews appear, the business receives a call from Yelp’s sales department, noting the negative reviews, and explaining that while paying $500 per month to Yelp will not enable the business to remove these negative reviews, it will give the business more control over its “Yelp presence”, including the elimination of ads from competing businesses on that business’s home page. If the business respectfully declines, it is then that the business’s positive reviews are filtered, or so has been reported to us over and over and over. My theory, giving Yelp the benefit of the doubt, is not that Yelp is retaliating, but that this sales process brings a human being into the equation, instead of just Yelp’s algorithm. Under Yelp’s “rules”, reviews are supposed to be entirely organic, and not the result of improper encouragement from the business. Perhaps in looking at all those positive reviews, said human being notices that many were posted in the same week, possibly indicating that there was some incentive provided that week for Yelp reviews. Or perhaps it is noticed that many of the reviews refer to the owners by name. Would so many people eating at a restaurant really know the owners’ names? Perhaps these raise red flags, and legitimate or not, it is decided that these positive reviews should be filtered. It is because of this sequence of events that so many people believe that Yelp is somehow responsible for the negative reviews, and that the removal of positive reviews is done to punish business that don’t subscribe. But whatever the reality may be, the undeniable fact is that fake reviews are posted on Yelp. We have repeatedly uncovered “fake review mills”, ranging from disgruntled former employees to full time staff members, hired to post negative reviews about competitors. Only false reviews need apply. We are not in the business of removing legitimate reviews. A review is only false if it asserts a VERIFIABLY false statement. An opinion can never be defamatory. The calls we typically get from doctors will illustrate the point. A doctor will call, upset by a Yelp review, because the patient said that she was kept waiting in the examination room far too long, and when the doctor finally did arrive, he was brusque and had terrible bedside manner. The doctor proclaims that he remembers that particular examination, and the reason the patient was kept waiting was because another patient coded in one of the examination rooms, and after the ambulance took him away, the doctor had to rush through his remaining appointments. The doctor wants to sue for defamation, because the review creates a false impression of how patients are treated. But none of the statements are verifiably false. The good doctor has a valid reason as to WHY the patient had a bad experience, but that does not alter the fact that the patient had a bad experience. There is no basis for a defamation claim. But often “Yelpers” feel compelled to embellish. If that same reviewer falsely stated that because the doctor was so rushed, he incorrectly diagnosed her as having a decease, THAT is a fact that is easily confirmed or refuted. If false, that makes the review defamatory because it casts the doctor in a false light. A reader might not be concerned that a doctor kept him waiting and then was brusque during the appointment – that is pretty much the norm – but if the doctor incompetently diagnosed a patient, that is a doctor to be avoided. That is the distinction between an opinion review, and a verifiably false review that can be removed from Yelp. 1. First, give a little time to see if the situation will resolve itself. Yelp’s own algorithm sometimes gets it right. Yelp is especially suspicious of what I call “one-up reviews”, where the reviewer created a Yelp identity just to trash one business. Yelp may filter the review with no action on your part. And there is always a chance that the person who posted the false review will get a case of conscious and remove it. Warning: If ultimately you decide to pursue the defamer, time is working against you. If the identity of the reviewer is unknown, it will be necessary to go through two rounds of subpoenas to determine their identity. First the IP address from which the review was posted must be obtained from Yelp, and then using that IP address, the customer information must be obtained from that person’s internet service provider (ISP). Problem is, many ISPs only maintain the information for 180 days. That may sound like a lot, but if Yelp and the ISP fight the subpoenas, you can end up against the 180 day deadline (although we have ways to make the ISP keep the information while we are going through the subpoena process). 2. Consider if you want to respond to the false review. Keep things in perspective. 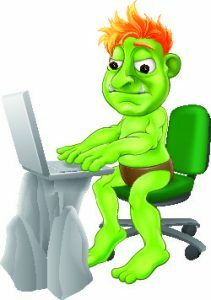 The internet world knows that trolls walk among us. It is a rare case that a business with many reviews does not have a few negative reviews. So long as the reviews are overwhelmingly positive, potential customers will ignore the background noise of a couple of negative reviews. But what if you only have a few reviews, or this one review is so bad that you just can’t let it stand? Should you respond? The conventional internet wisdom is “don’t feed the trolls”. The worst thing you can do is to negatively engage the reviewer. Not only does a negative response only serve to cement the negative impression the reviewer was trying to engender in the first place, but I have seen cases where the business’s response ends up being defamatory, and it is the business that gets sued. An angry customer who leaves a negative review will generally move on. But if you respond, daring to question that review, that often just fans the flames and causes the customer to respond with more negative statements. We are so sorry that you had a bad experience at our office. I do recall your visit, and you probably did not know, because it was all handled in the back, but a patient suffered a heart attack as you waited in the examination room. The patient had to be taken by ambulance to the nearest hospital. I stayed with the patient and administered emergency care until the ambulance arrived. That did take away time I would have normally spent with the patients. I hope you will give us another try, so you can see us on a good day. It will be hard for the reviewer to flame you for such a response, and having been informed of the circumstances, she may elect to take down the review, because it makes her look pretty bad. Warning: My hypothetical involves a doctor, and doctors (and any other profession requiring confidences) must be vigilant not to disclose any private information. The suggested response gives no details about the patient or why she was there (and she has already told the world she visited a doctor), so this response is safe. 3. Respond with a letter from an attorney. If you feel that the review must be addressed, a letter from an attorney can be very effective at removing false reviews. This presumes, of course, that the review is from a real customer, and that you can identify the customer. For the reasons already stated, I won’t send a letter to a Yelper, if the review is just opinion. The point of a letter from an attorney is to demand removal of the false review, and I can’t make such a demand if the review is not false. But if the customer posted a verifiably false review, then a letter can be effective IF done properly. Unfortunately, most attorneys erroneously believe that a cease and desist letter needs to be threatening and adversarial. They feel like the point of the letter is to intimidate the Yelper into removing the post with threats of fire and brimstone. The far more effective approach I employ is to let the Yelper know that I just want to do what’s right. If the client is telling me the review is false, but it is really true, then I want to know so that I can tell the client to go no further. On the other hand, I let the Yelper know that truth is a defense, so the burden is on the Yelper to prove any statements. For example, in one case the Yelper posted that no one should eat at a particular restaurant, because it was so dirty that it had been shut down by the Health Department, and was currently operating on a provisional Class C rating. I advised the Yelper that information was contrary to all I had been told and had found out through my investigations. I politely asked for the source of the information. The review was taken down that same day. If the Yelper won’t remove the false review, or you don’t know his identity to make the request, then legal action will be necessary. In order to subpoena the information necessary to identify the Yelper, a complaint must be filed. It is the complaint that provides the subpoena powers. Just learning the identity of the Yelper is often enough to resolve the matter. He posted the review, believing he would remain anonymous, but when it is discovered that he has never been to the business and only posted the fake review because his boss told him too, there is little incentive to carry on with the lie. 5. 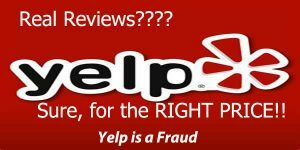 Compel Yelp to take down the review. Until recently, the courts had held that, pursuant to the Communications Decency Act (CDA), Yelp could not be compelled to take down anything posted by a third party (the Yelper). Now, thanks to the holding in a case called Hassell v. Bird, if a court concludes that a Yelp review is false, in conjunction with ordering the Yelper to take down the review, it can also order Yelp to do so, in the event the Yelper defies the order. Note, this does not mean that the victim of defamation can sue Yelp directly. The CDA still prevents any direct lawsuit against a review site for reviews posted by others. But now with the authority of Hassell v. Bird, Yelp can be included in the take-down order. If you are victimized by a false review on Yelp, where the statements are verifiably false, and you decide to take action to have it removed, call Morris & Stone at (714) 954-0700.